New Delhi:Amid intense debate about the need to amend provisions of the law related to the Armed Forces Special Power Act (AFSPA), Prime Minister Narendra Modi on Friday said he wants a country where there will be 'no need' for AFSPA but such a thing can be ensured only depending on the situation. 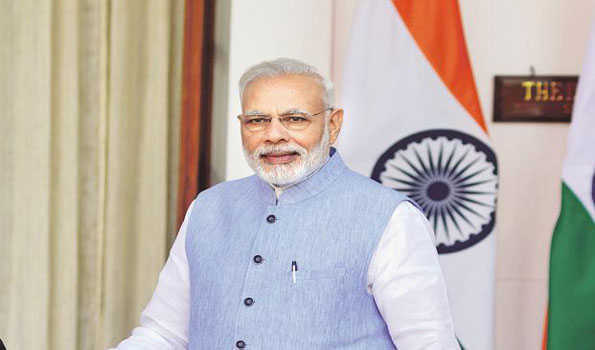 "Hum aisa Hindustan chahtey, jisme AFSPA honi nahi chahiye (We want a country where there is no need for AFSPA)," the Prime Minister said in an interview with a private channel. "However, the Congress efforts to play with the law or bring changes in the law is not acceptable," Prime Minister said. In this context, he said the Congress manifesto actually gives out the 'language' of Pakistan sponsored forces and this is a matter of concern. Answering questions, Mr Modi justified BJP's decision to ally with the PDP and maintained "It is true it was a case of two diametrically parties coming together.....but it was a necessary as there was no other way of forming a government in the state". But he suggested when the BJP arrived at an alliance with the PDP, it was held during the tenure of Mufti Mohammad Sayeed, who was a "matured" leader.